CALIFORNIA: Governor Gets Bill Allowing Some Cities To Decide If Bars Can Stay Open Until 4AM [VIDEO] - Joe.My.God. Gov. Jerry Brown will decide whether San Francisco, Oakland and five other California cities should be allowed to keep their bars open until 4 a.m. Under a bill the state Legislature approved Thursday, the cities could participate in a five-year pilot program that extends the time alcohol can be served at bars, nightclubs and restaurants by two hours, starting in 2021. 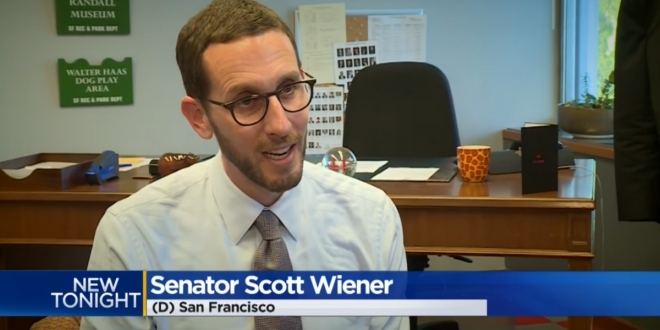 SB905 by state Sen. Scott Wiener, D-San Francisco, passed the Senate by 28-8 on Thursday. The Assembly approved it Wednesday. The bill heads to Brown, who has until Sept. 30 to sign it, veto it or let it become law without his signature. The governor has not indicated whether he will approve the bill. California Alcohol Policy Alliance (CAPA), Alcohol Justice, and Los Angeles City Councilmember Paul Koretz hosted a press event at Los Angeles City Hall yesterday to oppose SB 905 (Wiener) – the 4 a.m. bar bill. Emceed by actor/activist Kurtwood Smith, speakers representing groups and organizations throughout the state reported on the city and statewide public health and safety threats the bill would create by allowing a patchwork quilt of cities – including Los Angeles – to extend alcohol sales to 4 a.m.
“While we want our local businesses to thrive, no good can come from serving alcohol until 4 a.m. If this passes we can expect more DUIs, more drunk driving injuries and more alcohol related deaths,” stated Councilmember Koretz. The seven cities in the pilot program would be Long Beach, Los Angeles, Oakland, Palm Springs, Sacramento, San Francisco and West Hollywood. The Palm Springs City Council voted unanimously to participate earlier this year.